People who participate in adult education participate more in society, by voting, volunteering or taking active roles in communities. Adult education is the tool for the development of critical thinking. Adult learners lead healthier lifestyles and experience improved well-being. Adult education contributes to personal development and fulfilment. The health of our societies depends upon lifelong learning. Adult education transforms lives. It opens new job opportunities, creates pathways to learning, activates people’s artistic passions and builds new social networks. Adult education supports greater social mobility and equalizes societies. 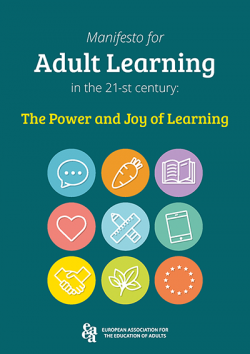 Adult learning brings together people from different walks and stages of life. This benefits democracy and social peace. Workplace learning is one of the key drivers of adults´ participation in lifelong learning. Adult education increases innovation and productivity of employees, entrepreneurs and volunteers–this makes companies more successful. Adult education helps to close the digital gap and provides individuals with digital competences, which are key to personal fulfilment, employment, social inclusion and active citizenship. Civic education and intercultural learning create inclusive societies and cultures. Seniors who learn are more active, work longer and stay healthier. Intergenerational learning enables older and the younger to profit from each other’s knowledge. Adult education provides competences, information, debating spaces and creativity to develop new approaches necessary for sustainable development. A paradigm shift is only possible through critical, conscious and innovative citizens. European & international policies Adult education contributes to main European and international strategies in the fields of growth, employment, innovation, equity, social cohesion, active citizenship, poverty reduction, climate change, internal market, migration, peace and more. Currently the updated manifesto is available only in English, the language versions will be published later in 2019.